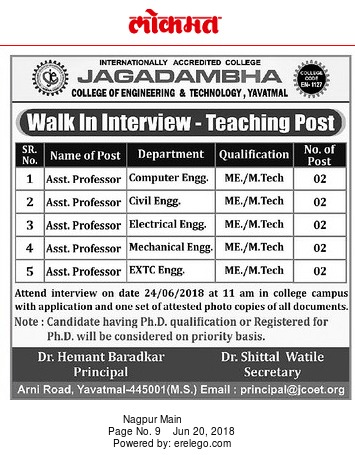 Jagadambha College of Engineering and Technology Yavatmal has advertised in LOKMAT newspaper for the recruitment of Teaching Faculty- Assistant Professor jobs vacancies. Interested and eligible job aspirants are requested to walk-in on 24th June 2018. Check out further more details below. About College: JAGADAMBHA BAHUUDDESHIYA GRAMIN VIKAS SANSTHA was formed in the year 2003 by the visionary Dr. Shittal A. Watile renouned educationalist with the lofty aim of providing quality professional education and meeting the rising expectations of the industry as well as the young students in region & around. JAGADAMBHA COLLEGE OF ENGINEERING & TECHNOLOGY, YAVATMAL , was established by JBGVS on an expanse of 11 acres on Nagpur Tuljapur Highway just 5 Km. from Yavatmal bus stand. Qualifications: M.E / M.Tech . Ph.D candidates will be preferred. How to Apply: Interested and eligible candidates are requested to attend the Walk-in interview application along with CV, one set of attested copies of certificates and recent passport size photos to the walk-in address given below. Reference: Advertisement from Jagadambha College of Engineering and Technology Yavatmal on LOKMAT newspaper dated 20th June 2018 for the recruitment of vacancy position Assistant Professor jobs. See the copy of advt below.